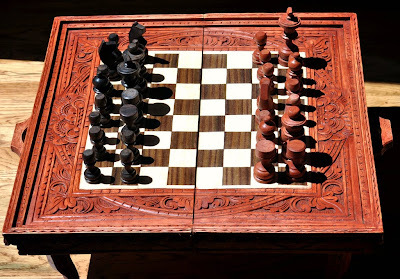 Shopping in paradise...there is nothing quite like it :-) I found this gorgeous Indonesian chess set at a lovely store in Kauai. I fell in love with it and despite my husband's apprehension, I hand carried it with me on the flight back. I love the carving, the gorgeous rust color and the fact that its made of teak. Do you give into temptation and shop on vacations?? I am joining Mary for the fabulous Mosaic Monday! I am joining Cindy for Show and Tell Friday! Do remember to sign up for my CSN Giveaway. Hi, Anu! I'm thank you for the sweet comment on my blog and the invite to your giveaway. Love the chess set. It's gorgeous and all the lovely things you brought back with you. Your mosaic is making me long for a vacation or a great visit to the beach. Hello Anu - I love the collection of shells mosaic. Your blog looks so interesting. I'll look forward to following it. 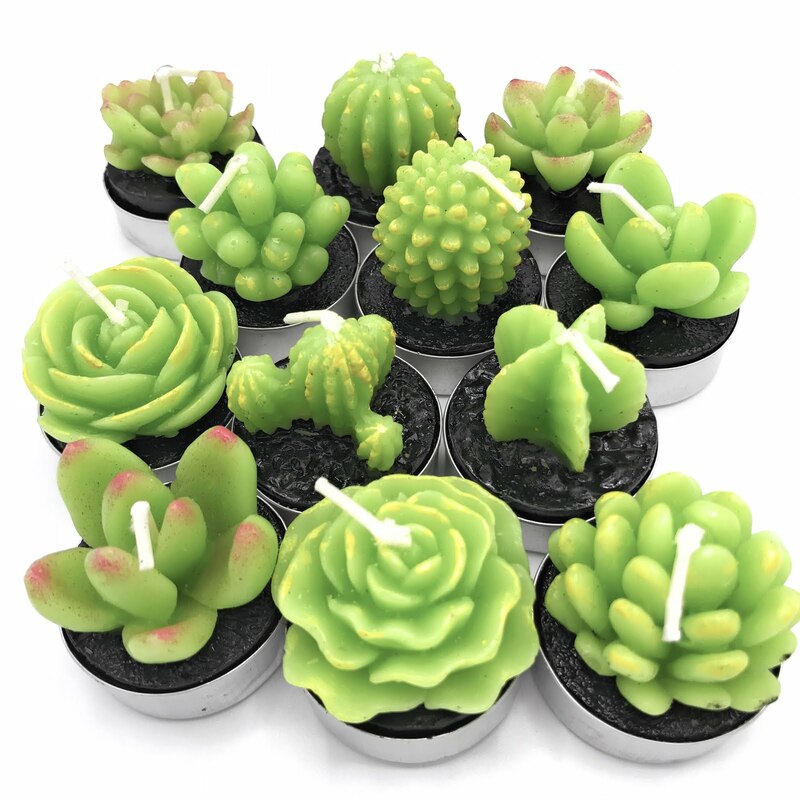 Please enter me in your giveaway. Thanks. 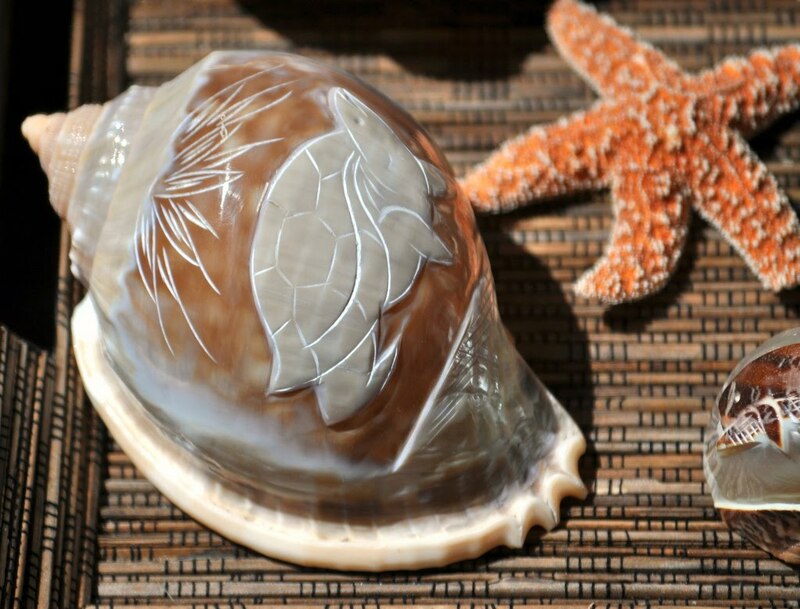 You can never go wrong with beautiful shells! Lovely! Thanks for sharing! 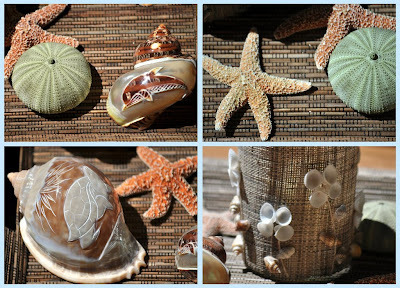 Such a pretty mosaic, but sea shells are one of my favorite subjects! Yes, when we vacation, I look for souvenirs...usually shells or sea glass. The beachy look is just beautiful, love it! Great mosaics! I once had my hubby carry tiles back from Rome. He's still complaining about it 8 years later...but they look beautiful in my kitchen! I love bringing things home from vacation too! Sea shells...so unique and lovely. Yes, I'm always tempted to shop. I try not to buy, but probably would not have been able to get by that lovely chessboard. 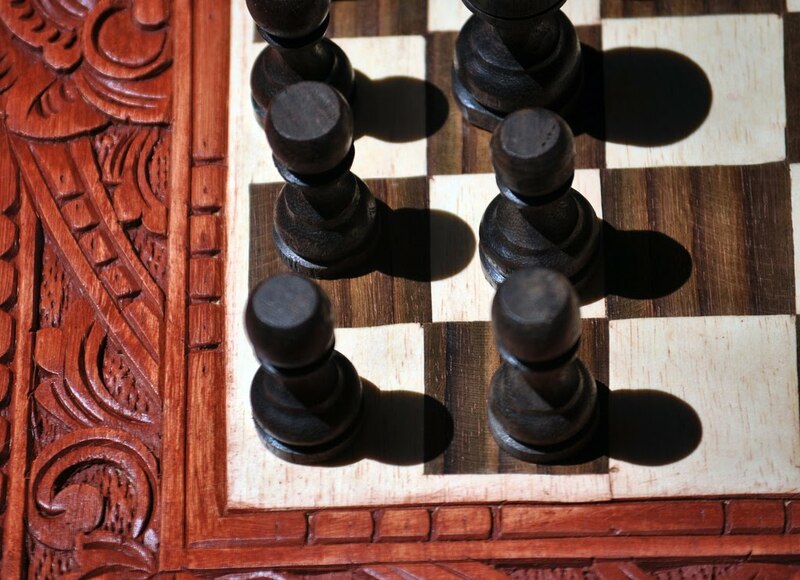 My chessboard is parquet and was made in Brazil. My sister didn't get by it on her trip there and I'm glad! Oh, my goodness, your mosaic and photos are beautiful!!! I am such a lover and collector of seashells...thanks for sharing. These are wonderful finds. I love Hawaii! I have been their twice. It is just gorgeous! Thanks for stopping by. I love shells too. They remind me of the ocean and the vastness of the world. Gorgeous chess set and I love your little bit of beach you brought home. 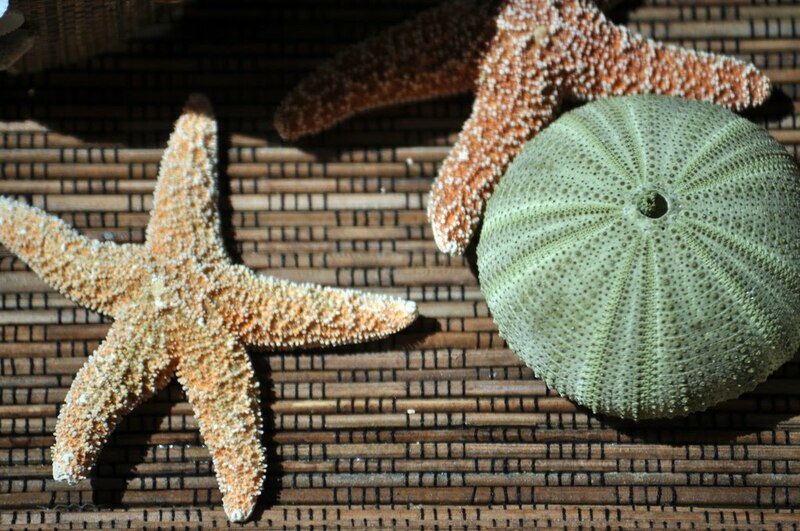 I love to bring home shells from my beach vacations. Just the smell of them sends you right back for a moment! Thanks for stopping by my blog. I'm a beach lover and I enjoyed your pretty shells and the chess set is wonderful. You have a very nice blog. I usually shop if there is a yarn store or something like that. Thanks for commenting on my blog today. I'd love to know what program or camera you used on the water photos on your previous post. The nice thing about bringing home treasures from vacations is all the memories those items will have for you. I love the shell mosaic, reminds me of my time on the beach looking for shells. Very nice chess set. Your shell vignette is beautiful! Thank you so much for visitin my blog and for leaving a comment. Beautiful chess set. 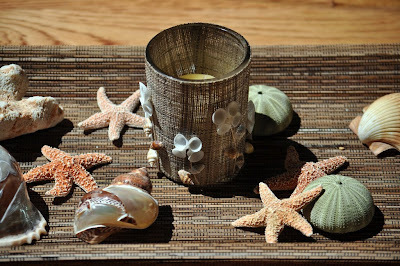 I love shells and have them everywhere. Yours are gorgeous. Great photo's. I did give into the urge to bring things home from Venice, though mostly it was things for kids and friends. A couple of Pashmina shawls for me to wrap around breakables. 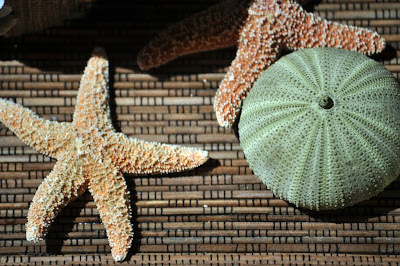 Love the shell mosaic -- nice soft colors and I'm partial to starfish. Kauai is my favorite! It's so unspoiled and beautiful! I had to laugh when you asked if I give into temptation to shop when on vacation... I suppose I would if not with my husband. He has a strong dislike for shopping, sees no point in it unless you know exactly what you are going to get. It's really painful shopping with him... and then it's painful for him because I'm a bit agitated when I don't have anything to show from a great trip... it's the cycle! ; )! Thanks for visiting my site and your give away offer! Have a great day! Beautiful treasures! Love the star fishes! Just ran across your blog and love it! I'm now following! I'm definitely a vacation shopper. 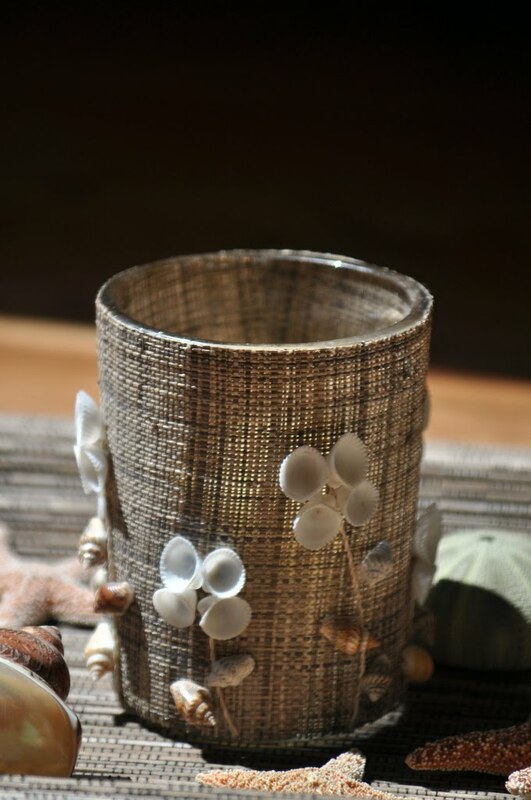 I love those pieces that are one-of-a-kind. Oh my shopping is one of my favorite passtimes on vacation and who could resist this lovely game board. Thanks for stopping by. Love your blog, hope to see more of you. Hi Anu, thank you for your lovely comments on my blog. You have a wonderful space here with such wonderful creative ideas. absolutely love it. 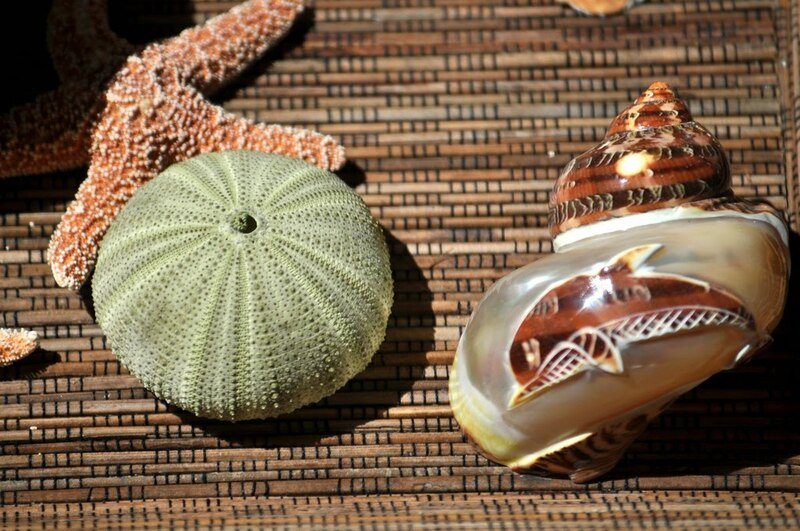 Love the mosaic of the shells..worth framing! That is a marvelous gameboard and I love all your seashell items especially the glass covered i burlap and the seashells attached. Have a great weekend. Wow....most of all, I covet that shell with the turtle carving!! Whoa...what a treasure. Beautiful chess set!! the wood carving around it very pretty!! Beautiful checker board, i liked all shells. I was used to buy when i was in India. Beautiful photographs. Thanks for stopping at my blog. Do visit often. Pretty chess set and shells! I really like the one with the turtle carved on it. Oh, how pretty and unique! Thanks so much for stopping by at my place!